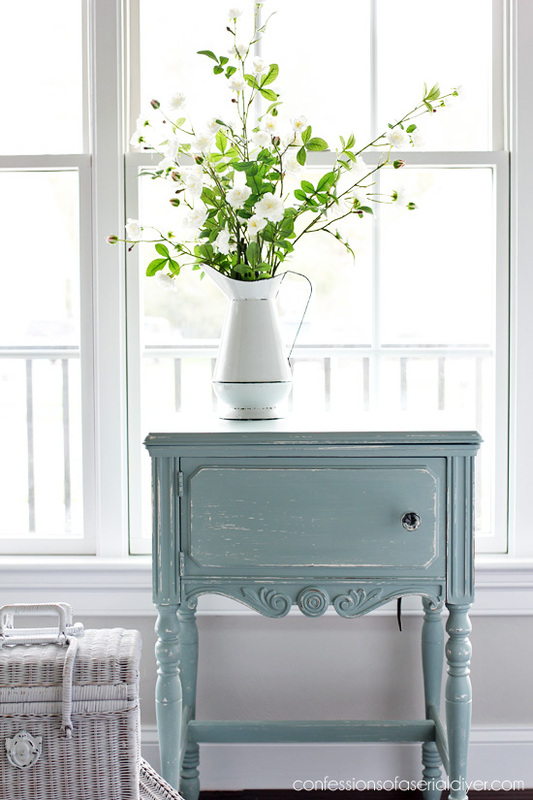 The awesome thing about painting furniture white is that if you ever tire of it, it is a great base for so many other colors. Today, amazing friends, I thought I would share one of the pieces I used to have in our old house that I no longer have room for in our new house. And yep I painted it…again! 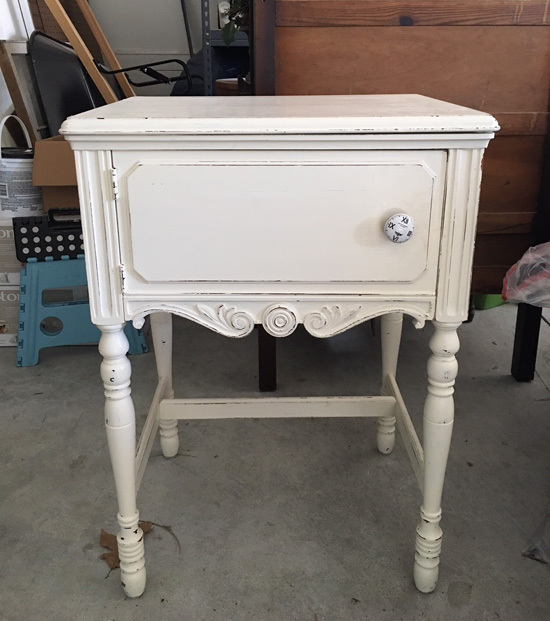 I originally painted it Cottage White. 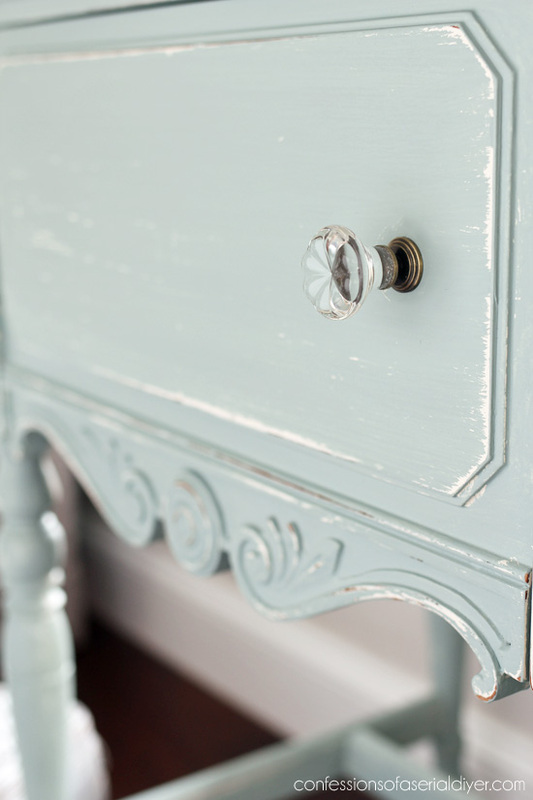 It is the very first piece of furniture I ever painted using DIY chalk paint! As you can see, it still looked great. I just thought it would be fun to change it up a bit. Pretty in blue too, eh? I only gave it one coat so a lot of the white from underneath would show through. A quick sanding with 220 grit sandpaper gave me exactly the look I was going for. I wish I had a place for it at our new house, but unfortunately I do not so this will be heading to my booth. Sometimes they have really pretty knobs for super cheap. This came in a pack of six or eight. The original machine is still inside. That’s the cord you see hanging down from underneath. 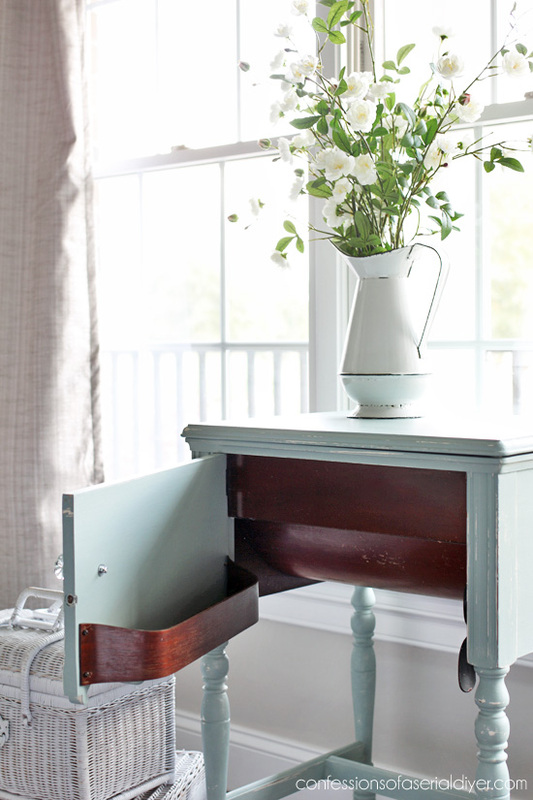 These sewing tables make fantastic side tables! 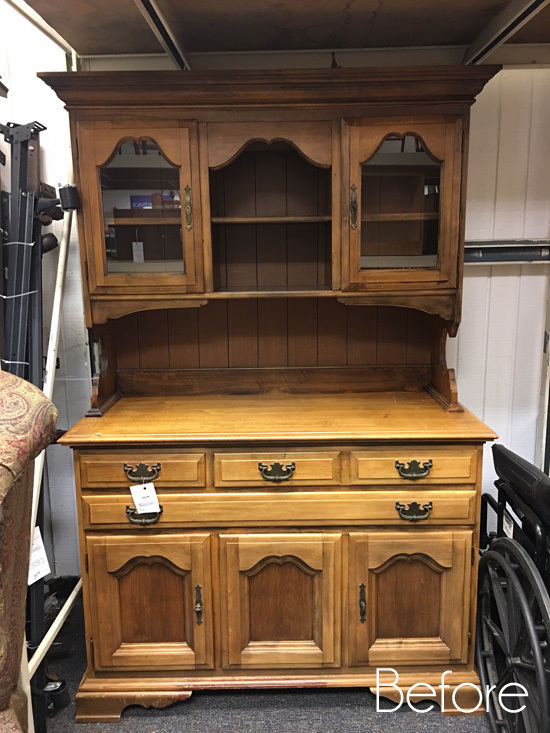 This isn’t very functional as far as storage goes, but you could at least stash the remotes in that little pocket on the door. Remember my baskets I spray painted? They make great props! See their makeover HERE. That’s just one of the pieces I refreshed to put in my booth, but everything else stayed the same color they were before. I hope you enjoyed this redo of a redo! See how it looks now HERE! It is Thanksgiving on Thursday here in the U.S. so I won’t be here, but I want you to know that I am SO very thankful for each and every one of you who show up here faithfully to see what I am up to. I appreciate you more than words can say. I hope my friends in the states have a blessed Thanksgiving! 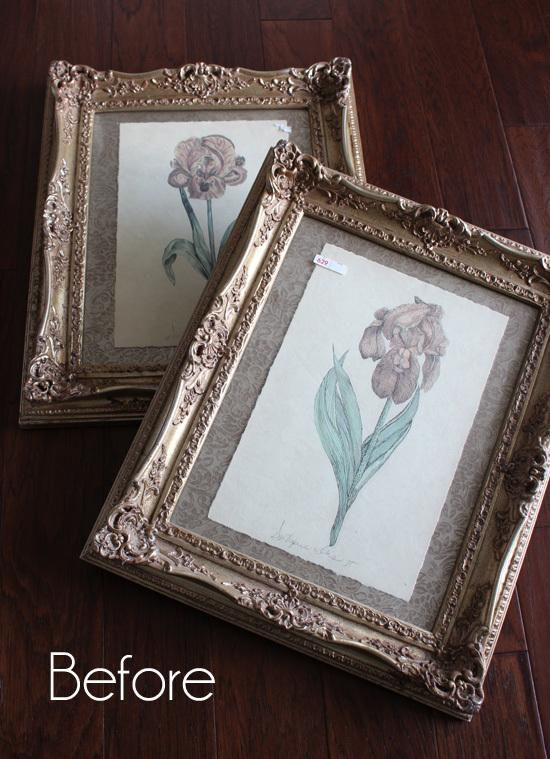 I’ll see you next week sharing what I did with these frames to create artwork for my dining room walls! 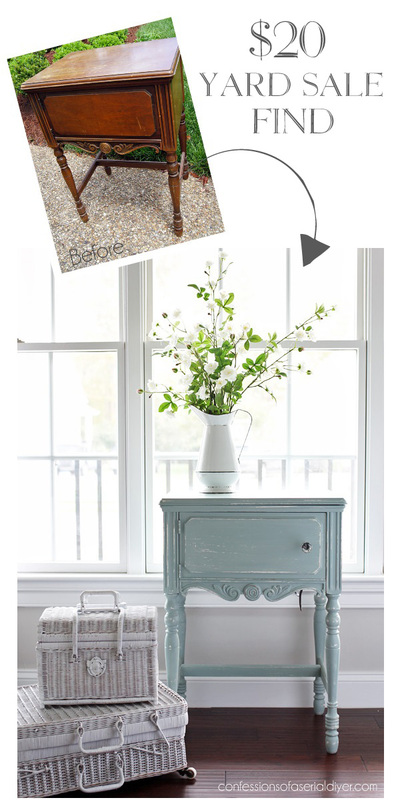 UPDATE: See how these frames become beautiful artwork for my dining room walls HERE now! Don’t ask me why but I don’t remember the sewing table. I thought I had seen everything you’ve done but guess not because don’t think I would have forgotten this one. It was beautiful in white but also just as beautiful in blue. Happy Thanksgiving to you and your entire family. Look forward to next week. Christy, you know I love the grey/blue color. 🙂 This piece will be snatched up in a hurry. Also, inspiration to paint the working sewing table I finally have out of storage. Though I’ll be taking the 30lb Singer 15-91 out of it to paint it. 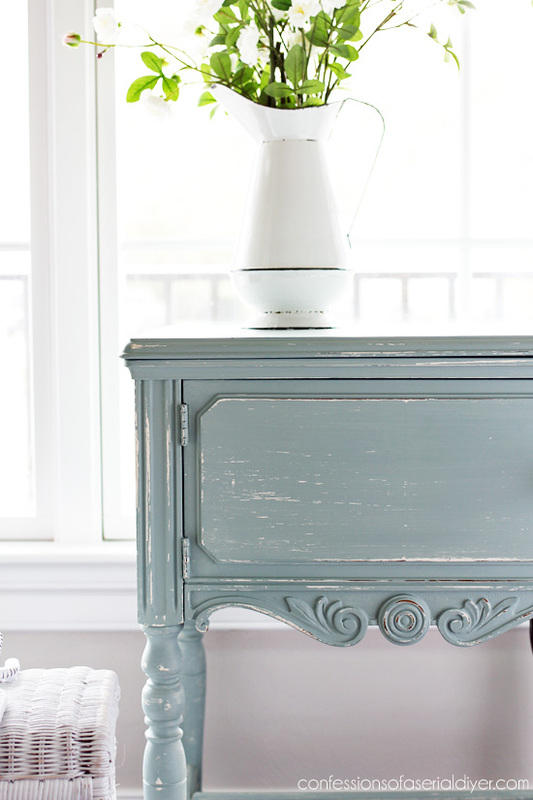 DIY chalk paint all the way! I’ll bet that someone will fall in love with this pretty quickly! 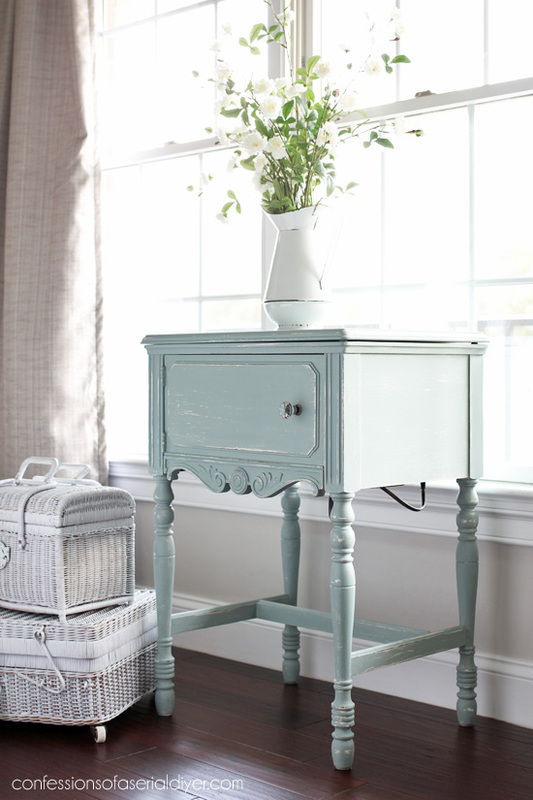 Isn’t it wonderful what a little paint can do. Your piece is beautiful, love the color. Happy Thanksgiving to you and your sweet family. Lovely before, even better after! 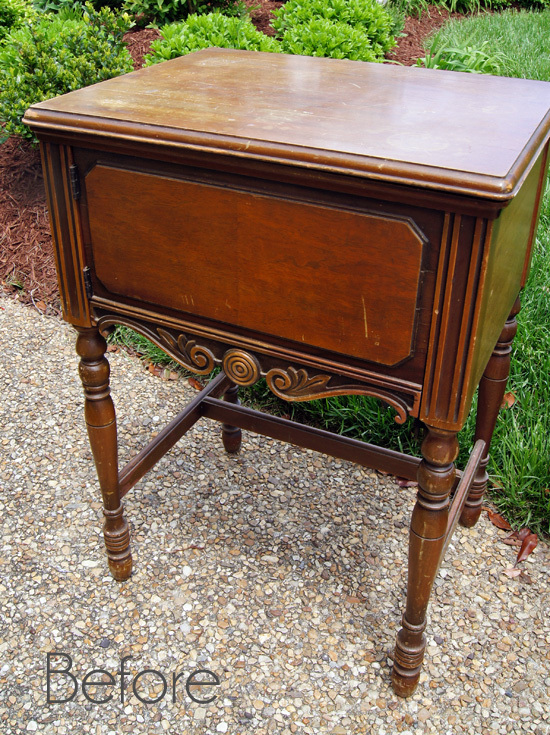 I adore those old sewing machine tables and this one has great details. Were you never once tempted to try the machine and see if it worked? 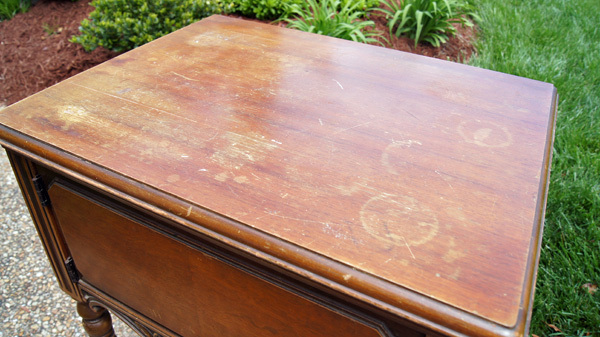 Technique question: Did you paint over the old waxed surface or sand it first? 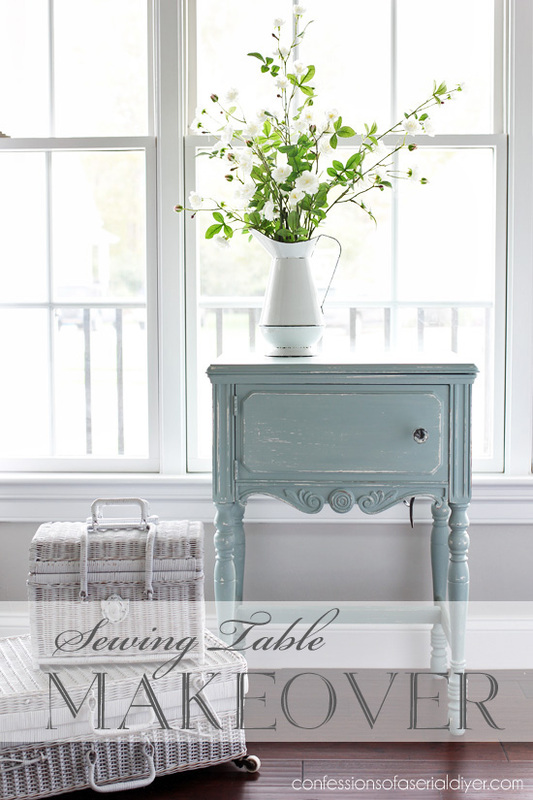 I love sewing tables as seen by the many I have in my hoard awaiting makeovers. None are as pretty as this one with all the details, though. 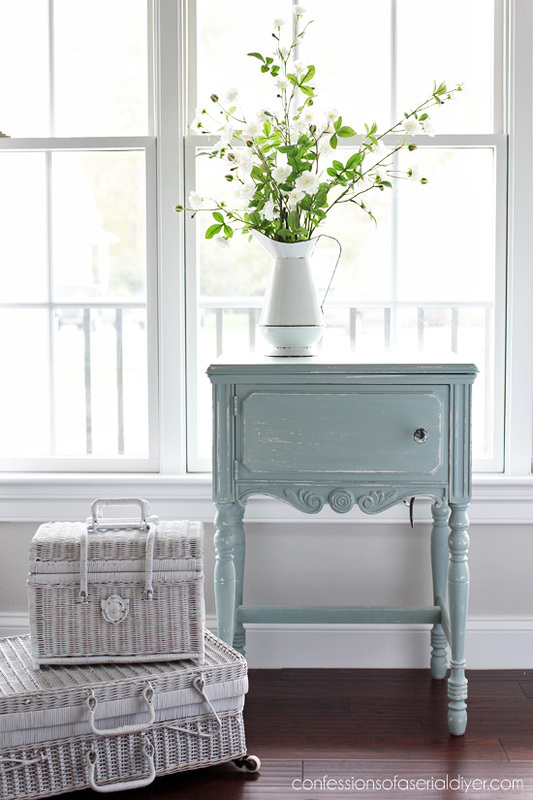 Thanks for showing that things can always be refreshed and shift with your decor. Happy Thanksgiving! Beautiful piece and color, I like how the white shows through. Happy Thanksgiving to you and family! I love it. It is adorable. Have a wonderful Thanksgiving holiday with your family. I love the new color. Greenish-blue is my current favorite and what I used on my bedroom walls (after living with builder off-white for 20 years). I do love the color! It looks so nice. The detail in the blue looks so whimsical! I like this! I have one similar that was my Mom’s but it has contact paper on it from years ago, it may actually pull wood off if I remove it but I hope to re-do someday soon. Thank you for inspiration and sharing! Happy Thanksgiving! God bless you & your family! The blue is pretty, but I’m smitten with that white “before”. It’s lovely in blue as well! These little sewing tables are hard to find here where I live for some reason. I’m swooning over yours. Catching up on posts and hope you had a lovely Thanksgiving, Christy!